Maybe you remember this song by the Police. I wonder if this is now the theme song for the NSA. Although Every Breath You Take was primarily about a jealous lover (a stalker? ), Sting had surveillance in mind as he wrote it. I woke up in the middle of the night with that line in my head, sat down at the piano and had written it in half an hour. The tune itself is generic, an aggregate of hundreds of others, but the words are interesting. It sounds like a comforting love song. I didn’t realize at the time how sinister it is. I think I was thinking of Big Brother, surveillance and control. Fitting for these times, isn’t it? That’s Latin for “Who will watch the guardians themselves?” or maybe “who will watch the watchers?” An essential institution of any modern, civilized state are guardians or police who are charged with enforcing the laws of that state. Yet, how do you ensure that the guardians or law enforcers themselves will follow the laws and not abuse their position. I don’t doubt that a great many policemen want to serve their community, but the nature of the job of law enforcement naturally tends to attract the sort of people who like to push others around and think that a badge will allow them to get away with it. This tendency is aggravated when a police culture develops that sees the police not as public servants but as a separate and superior caste while the civilians they are charged to protect are seen as potential criminals. Many years ago, when I was attending Indiana University at Bloomington, I found, while browsing a local book store, a book of humorous anecdotes written by a, I hope, retired police officer. These humorous anecdotes displayed an incredible contempt for civilians, or “tax-payers” as he humorously referred to them. In one such story, he related how he pulled over a woman who was speeding. The woman was somewhat irate and asked him why he wasn’t out catching criminals. He looked right at her and said, “That’s what I am doing now.” Hahahahahaha. No, he wasn’t. Speeding is an infraction, not a criminal offense. The woman might have been rude, but she was not a criminal, despite what the author of the book thought. With that kind of an attitude, I hope he is retired. 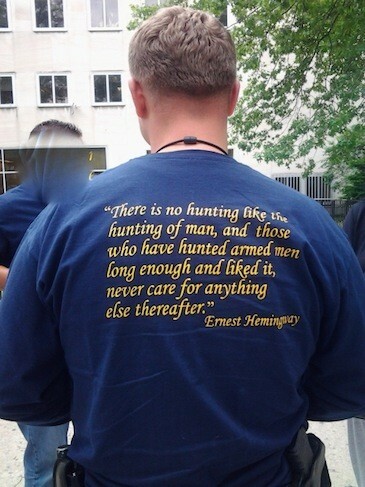 With all that in mind, consider this article about the kind of T-shirts favored by cops, written by Radley Balko on the Huffington Post. If the attitudes displayed are typical of police departments, then it is a rather disturbing trend. See what I mean? 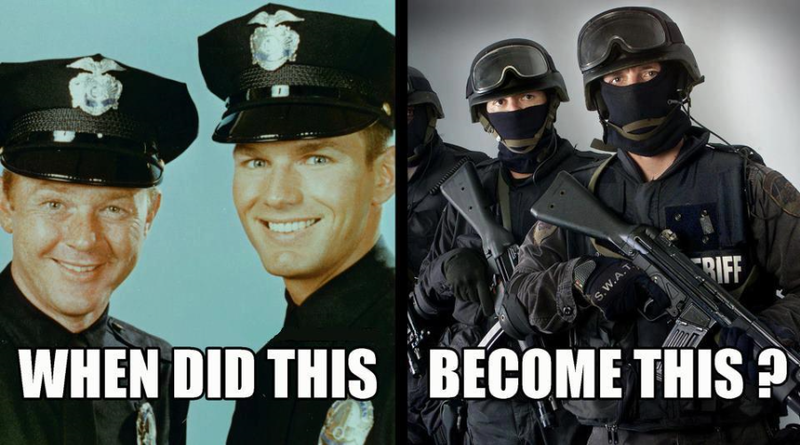 It doesn’t help that there has been a trend towards more militarized police department, in large part due to the war on drugs. Here’s some more. 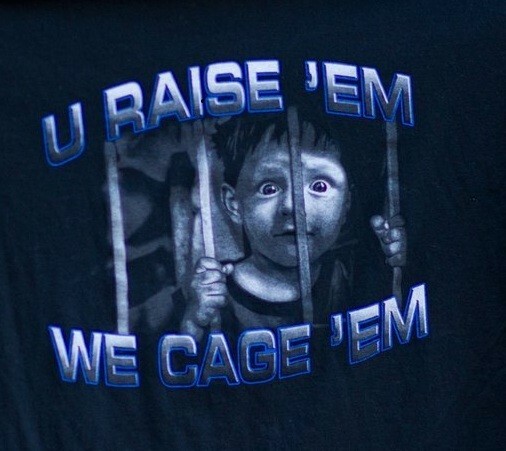 It’s no coincidence that the same departments and units caught wearing shirts displaying this sort of attitude tend to also get caught up in controversial beatings, shootings, and other allegations of misconduct and excessive force. The “us vs. them” mindset has become so common in U.S. police culture that we almost take it for granted. In my new book, I argue that this is the result of a generation of incessant rhetoric from politicians who treat cops as if they were soldiers, and policies that train and equip them as if they were fighting a war. The imagery and language depicted on the shirts in these stories are little different than the way pop culture, the military, and government propaganda have depicted the citizens of the countries we’ve fought in wars over the years. Balko also quotes comments from a police forum. — “I have one that sates “SWAT SNIPER” on the front and on back it has a picure of a “terrorist” with a shell ripping through his skull and the “pink mist” spraying from the back of his head. Below the picture it reads, “Guerillas in the mist”. It’s worth noting that policing is a high-stress job, and one that often puts officers in contact with some pretty awful things, and in some dangerous situations. Like other high-stress professions, and professions that encounter difficult subject matter — defense attorneys, medical examiners, emergency room doctors and nurses — cops often develop a morbid sense of humor. It’s a coping mechanism. But it’s one thing to crack jokes inside the department, or at the bar after work. It’s quite another to openly advertise and promote a culture of abuse. As with most police abuse issues, the real failure here is on the part of the elected officials. They’re the ones who can’t resist the urge to incessantly declare “war” on things, who are responsible for setting the policies that have given rise to this culture, and who have done little to nothing to rein it in. I do wish that politicians would stop declaring war on things. In war, there can be no compromises. You either defeat the enemy or they defeat you. In domestic issues, like drug abuse, you have to balance costs and benefits in a way you do not in war. Making every issue a war encourages extreme, irrational policies, and justifies abuse. But as to the police attitudes and potential abuse, it all comes back to the question, quis custodiet ipsos custodes. Police didn’t have to look far to find a man hoping to buy marijuana Thursday. Michael Krebes, 31, of Vernon, put an ad on Craigslist looking to buy pot, police said. Members of the East Central Narcotics Task Force answered the ad, and set up a location to meet Krebes. Officers set up surveillance and waited for Krebes to arrive. Sure enough, he showed up at the McDonald’s on Main Street in Glastonbury Thursday, where police took him into custody. Krebes was charged with Criminal Attempt/Possession of less than 4 ounces of Marijuana. He was released on $2,500 bond. What kind of an idiot do you have to be to advertise your wish to buy a controlled substance in a place the whole world, including the police, can see. I wonder what other kinds of foolishness I’d find on Craigslist if I looked around. I suppose it’s a common fantasy when you have some argument over billing with a company or utility, to pay the bill in pennies. Jason West of Vernal, Utah did just that over a disputed doctor’s bill of $25. The clerks at the doctor’s office were not amused and called the police. Police said 38-year-old Jason West went to a clinic in Vernal, Utah, on May 27 to dispute an outstanding bill for $25. West was cited for disorderly conduct and now faces a fine of $140. I wonder if he is going to pay that in pennies. 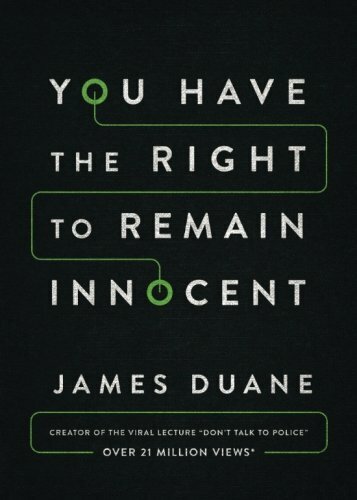 “Fourth amendment? We don’t need no stinkin’ fourth amendment“. So ruled the Indiana Supreme Court, in effect. In a 3-2 decision, Justice Steven David writing for the court said if a police officer wants to enter a home for any reason or no reason at all, a homeowner cannot do anything to block the officer’s entry. So apparently, now the police can enter your home for any reason. Of course, you can sue them afterwards, after spending the night in jail, and if you can afford a decent lawyer. The court’s decision stems from a Vanderburgh County case in which police were called to investigate a husband and wife arguing outside their apartment. When the couple went back inside their apartment, the husband told police they were not needed and blocked the doorway so they could not enter. When an officer entered anyway, the husband shoved the officer against a wall. A second officer then used a stun gun on the husband and arrested him. I agree that the man should not have shoved the officer. That was assault and reason enough to arrest him. And yet, if there was no obvious crime involved, why did the officer have the right to enter this man’s apartment? I agree. Whatever the merits of this particular case, this decision could well be used as a precedent for the police to enter in a person’s home without a warrant , or any sign of a crime being committed.